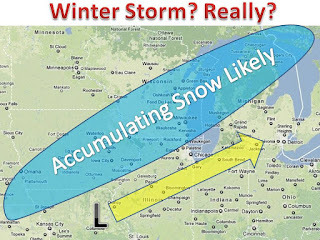 It has been a long time since the Midwest was on the verge of any significant weather. This Thursday may be the first widespread winter storm of the season. It is taking the perfect track for heavy snow much of the midwest. Models are finally beginning to agree on a solution, a snowy solution at that. The area on the map show the most likely area of 2" or more of snow on Thursday. As of now the heaviest snows appear to occur in far NE IA and southern WI. Exact totals vary from model to model, but 4-8" is definitely not out of the question. If i had to put a guess on it now i would say the heaviest areas will see 2-5". It is 3-4 days out, and will know much more in the next 36-48 hours. Hopefully confidence is high enough for a snow map by Wed at the latest. Edit: Thunderstorms in the south are going to soak up all the moisture, a dusting to an inch at best in the blue outline. 1-2" in central Michigan.